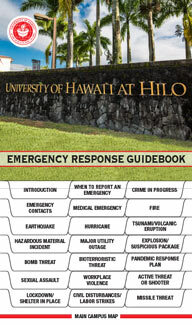 We wish to remind all University employees of their obligation to immediately report to Campus Security any criminal activity that occurs on University property or involves UH Hilo faculty, staff and/or students. This means any crime that has occurred , any crime in progress, and any suspected criminal activity. When you become aware of any criminal activity or suspected criminal activity, call Campus Security at 974-7911, or, from on-campus phones, extension 7911. The importance of taking responsibility to report incidents and suspected criminal activity immediately is paramount to ensuring appropriate action is taken to apprehend perpetrators, ensure proper procedures are followed to backup insurance claims, and to enact measures aimed at the prevention of like incidents. It is expected that any UH Hilo employee who is a witness to a crime, or has alleged information that may be pertinent to the apprehension of perpetrators, cooperate fully with Campus Security and law enforcement officers. The UH Hilo Campus Security website has a link that allows you to submit an anonymous report through the "Silent Witness Program," although we highly recommend that you contact Campus Security directly. For more information please see the Campus Security website. Thank you for your involvement in enhancing the safety of the UH Hilo campus. Refer a Student of Concern to the UH Hilo Care Team. Report a potential crime anonymously via the Silent Witness system.